One of the most famous mind-twisters of the quantum world is the thought experiment known as "Schroedinger's Cat," in which a cat placed in a box and potentially exposed to poison is simultaneously dead and alive until someone opens the box and peeks inside. Scientists have known for a long time that an atom or molecule can also be in two different states at once. Now researchers at the Stanford PULSE Institute and the Department of Energy's SLAC National Accelerator Laboratory have exploited this Schroedinger's Cat behavior to create X-ray movies of atomic motion with much more detail than ever before. The first test of this idea, at SLAC's Linac Coherent Light Source (LCLS) X-ray laser, created the world's most detailed X-ray movie of the inner machinery of a molecule — in this case, a two-atom molecule of iodine. The results, based on an experiment led by SLAC staff scientist Mike Glownia, were reported in a paper that's been posted on the arXiv online repository and accepted for publication in Physical Review Letters. The team was able to see details of the molecule's behavior as small as .3 angstrom – less than the width of an atom — and as brief as 30 millionths of a billionth of a second, a timescale that captures the vibrations of atoms and molecules. What's more, they say their method can be retroactively applied to data from past experiments, not just to future studies. "Our method is fundamental to quantum mechanics, so we are eager to try it on other small molecular systems, including systems involved in vision, photosynthesis, protecting DNA from UV damage and other important functions in living things," said Phil Bucksbaum, a professor at SLAC and Stanford University and director of PULSE, which is jointly operated by the lab and the university. The new technique is based on the fact that when a molecule absorbs a short burst of energy, it splits into two versions of itself — one excited, the other not. A follow-up burst of X-ray laser light scatters off both versions of the molecule and recombines to form an X-ray hologram that, after some clever processing, reveals the excited state of the molecule in stunning detail. By stringing together a series of these X-ray snapshots, scientists can make a stop-action movie. "Our movie, which is based on images from billions of iodine gas molecules, shows all the possible ways the iodine molecule behaves when it's excited with this amount of energy," Bucksbaum said. "We see it start to vibrate, with the two atoms veering toward and away from each other like they were joined by a spring. At the same time, we see the bond between the atoms break, and the atoms fly off into the void. Simultaneously we see them still connected, but hanging out for a while at some distance from each other before moving back in. As time goes on, we see the vibrations die down until the molecule is at rest again. All these possible outcomes happen within a few trillionths of a second." Although the initial laser pulse hits only 4 or 5 percent of the molecules in the iodine gas cloud, it would be incorrect to say that only this small fraction was excited and the rest were not, Bucksbaum added. In quantum mechanical terms, every single molecule was excited a little bit, like a Schroedinger's Cat that's both dead and alive. This dual state was key to making the molecular movie. It allowed the X-rays to bounce off both states of a molecule at once and recombine to form a hologram — a pattern of concentric rings that are brighter where the two signals reinforce each other and darker where they cancel each other out. The fact that this pattern formed in the LCLS detector proves that the excited and unexcited states were simultaneously present in each and every molecule, Bucksbaum said; if they had been separated by even a tiny distance, the pattern could not have formed. The team used mathematical techniques borrowed from atomic physics to amplify the signal from the excited state, which would form the basis of the movie. But the signal from the unexcited state also played an important role, serving as a reference point that helped them reconstruct the behavior of the excited molecule in three dimensions in a process known as "phasing." 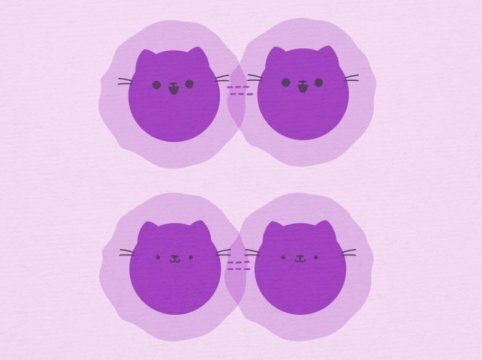 Any group of molecules hit with a laser pulse will respond the same way, splitting into the equivalent of live and dead cats, Bucksbaum said. But the process can only be clearly and directly observed with intense, ultrashort pulses of coherent light like those from an X-ray laser, and until now no one had thought to take advantage of the Schroedinger's Cat connection to sharpen images taken with X-rays. "The X-ray diffraction community had never used these tools the way we did," said Adi Natan, a PULSE research associate and experimental physicist who led that part of the project. He said the team is already applying their method to data from previous experiments at LCLS to see if they can create more molecular movies. LCLS is a DOE Office of Science User Facility. The research was funded by the DOE Office of Science and included scientists from PULSE, LCLS and Stanford. The above post is reprinted from materials provided by SLAC National Accelerator Laboratory. Note: Content may be edited for style and length.